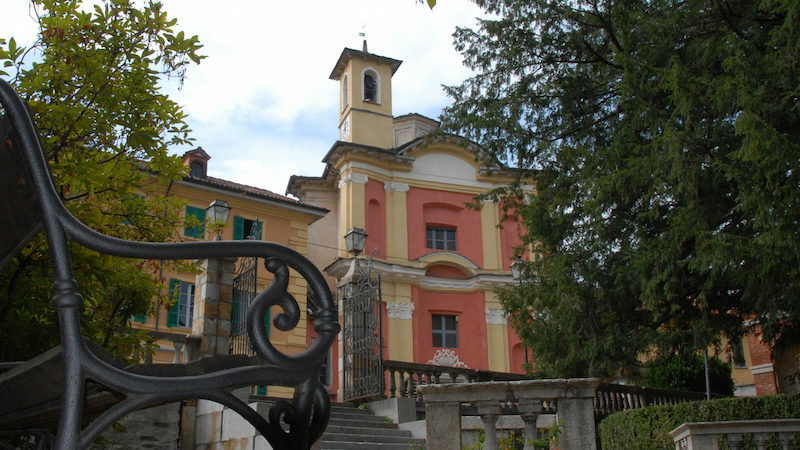 Contemporary art fans who love Italy and especially its northern region Piedmont have to visit the village of Ameno during the first weekend of July. This is when the idyllic village situated above beautiful Orta lake becomes one large exhibition place of contemporary art. During the event ‘Studi Aperti‘ (i.e. Open artist studios) artists and villagers open their workshops and houses to visitors. During the first half of the 20th century the region of Lake Orta with the town Omegna used to be one Italian epicentre of the household goods industry with companies such as Alessi, Bialetti and Lagostina headquartered and producing there. Factories and bustle then were the trademarks of the region between Lake Orta and Lake Maggiore. When labour moved to cheaper places life calmed down in the villages around the lakes. For some villages like Ameno this was fortunate, as quiet and indifference preserved its authentic beauty leaving it untouched by modernization. The transformation of Ameno was of a different kind. In the 1999 Swiss artist Adrian Hossli came to Ameno and found the lithography workshop ‘Stampameno’ in the bucolic Villa Pastore. More colleagues followed him falling in love with the contemplative atmosphere and quiet of the place. In 2004 the artist Enrica Borghi and the author Davide Vanotti, her husband, moved to Ameno. Once arrived in the village to work and live there in 2005 they found Asilo Bianco as a platform to delve into the transformation of village and region through their own mediums: contemporary art and writing. The new platform’s goal was put into practice immediately by opening their workshops to the village inhabitants to explain their work practices and thus even contemporary art. The project Studi Aperti was born. To be interested in a region, in a place never means to care only about the nearby and obvious, rather the opposite is the case, explains Enrica Borghi. It meant to be interested and open to national and international culture, to bring open and current dialogue and reflection about current issues to the region thus opening up new perspectives. No wonder that a group of Senegalese immigrants working and living near Ameno came into Asilo Bianco’s field of vision and participated in one of the early projects. Moreover, Asilo Bianco creates synergies with the existing cultural heritage. First a group of knitting women catches my eye immediately after having arrived in Ameno for ‘Studi Aperti‘. They are the Tricottine di Ameno and have become artists this year only with their works participating in the exhibition in the Park Neogotico and in front of Ameno’s town hall. Ameno makes a bustling impression on me. At first glance I can’t distinguish artists from inhabitants, visitors or tourists. Or bloggers, just like us. The Museum Tornielli, an exhibition place all year round, is situated in the town hall’s courtyard. After the museum we have visited almost all of the 16 exhibition sites. Often we catch the artists themselves who tell us a bit about their motivations of their work. Little by little the universe of Ameno opens its vision to me, a fascinating kaleidoscope of old and new, near and far. A true and own social space, a zone where partition and distance blur and leave space for commonality and exchange. Disciplines, people and ideas become entangled. For three wonderful days Ameno is a micro cosmos full of exhibitions, experiments and stories. The exhibition “50+! Il grande gioco dell’industria” (i.e. “50+! The great game of the industry“) picks up the threads of the region’s great past in household goods production and shows moments from the life of Italian society during the 20th century by exhibiting 50 plus iconic objects. Picture the Alessi coffee maker, the Barilla pasta box or the Campari Soda drink. You probably agree, that many of these objects have shaped a life style way beyond Italy! The section “Sparkling” is dedicated to emerging artists all under the age of 30 like Giulio Maulini who tells us about his painting “Nutriment” exhibited at Museo Tornielli. In Villa Pastore Moritz Hossli shows his video installation “Distance”. Roman artist Romina Bassu deals with the female quest to outer beauty including even surgical optimization. The works of Enrica Borghi, founder of Asilo Bianco, are all centred around femininity and recycling, expressed by means of installations and publications. A great example is “La Regina” – The Queen – (1999), a huge ball gown made from used plastic bottles and acrylic glass. During ‘Studi Aperti‘ she held the 24hoursworkshop to begin a similar installation. The section on architecture and landscape architecture ‘Paesaggi mirati‘ (i.e. ‘Targeted landscapes’) has been another highlight for me. And one thing I know for sure: I will return to Ameno many more times, but definitely this autumn for the Festival of Rural Cinema Corto e Fieno. How to get there: from Turin you need to take the highway A4 and then the highway A26. Take “Borgomanero” exit and then SP229. After Gozzone take the SS229 until Ameno. Where to sleep: Palazzo Ducloz, Il Bosso del Lago or B&B Da Giacomone. 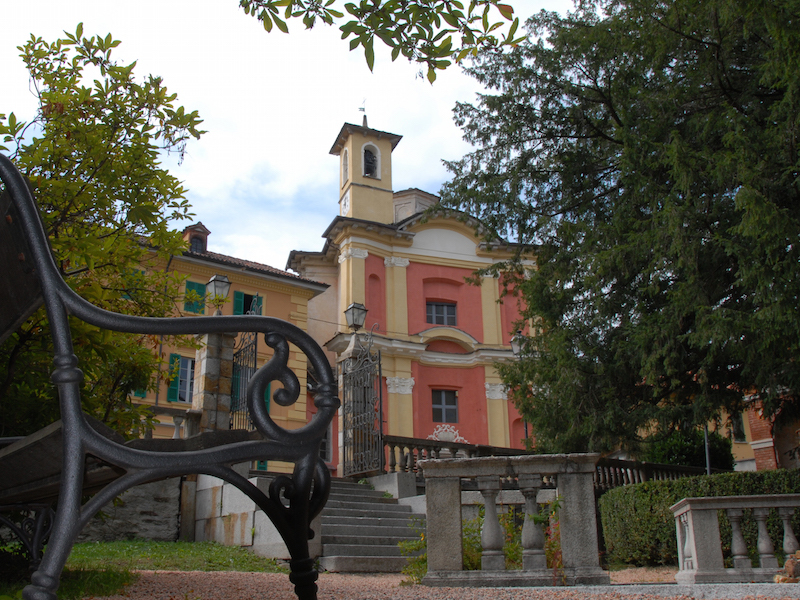 What to visit: Ameno and Orta San Giuliano Lake Orta. What to do: visiting the centre of Ameno.